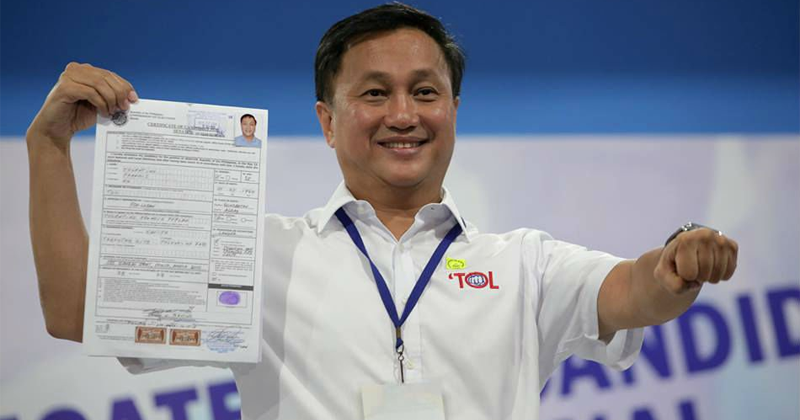 Presidential Adviser on Political Affairs Francis Tolentino has filed his certificate of candidacy in his second bid for a seat at the Senate after his bitter defeat in the 2016 race. Tolentino lost to 12th placer Leila de Lima in the last Senate polls by over 1.3 million votes. He filed an electoral protest, claiming he was cheated. Tolentino was once an ally of the erstwhile ruling Liberal Party, but a controversy during the oath-taking of new LP members prior to the elections caused the then-ruling party to distance itself from him. Losing in the Senate race, Tolentino took on the job as President Duterte’s political adviser, bringing with him his experience as a long-time mayor of Tagaytay City. In the latest Pulse Asia senatorial survey, Tolentino ranked 24-30.